At Church Interiors, our recommendation is our reversible pew cushions which make your pew seating more comfortable without permanent upholstering. Our reversible cushions are elegant and durable, matching the quality of your church's solid wood pews. 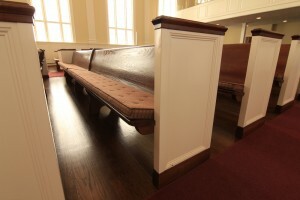 Cushions available for curved or straight church pews. Cushions are sewn together using French seams with nylon thread. Tufting buttons are necessary to prevent seam slippage and are standard on all cushions. Available in standard 2" Boxed, Roll Front and 2" to 1" Tapered. All cushions styles are reversible. Seat only permanent upholstery costs less than cushions. To make your church decorating project easier, we provide custom colors at no extra charge. Note: Sunlight damage is not covered under our standard warranty. High UV fabrics are available. Inquire for more information on our church pew cushions, pads and pews.